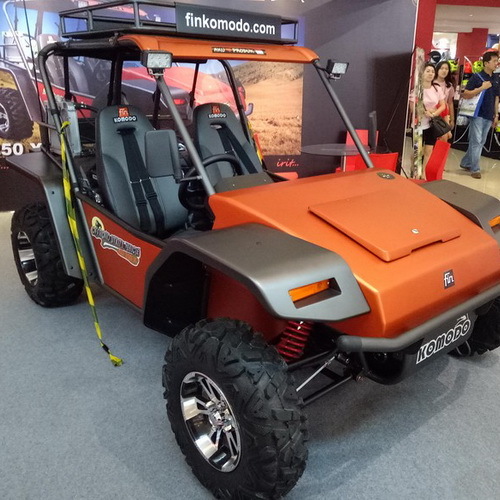 Tinuku ~ Fin Komodo presents the latest generation is the KD 250 X at Indonesia International Motor Show (IIMS) 2017. Offroad mini car manufacturer has launched the latest model that has got some refinement. The design remains the same, but claimed more spacious than ever and the addition of power outlets for gadgets. 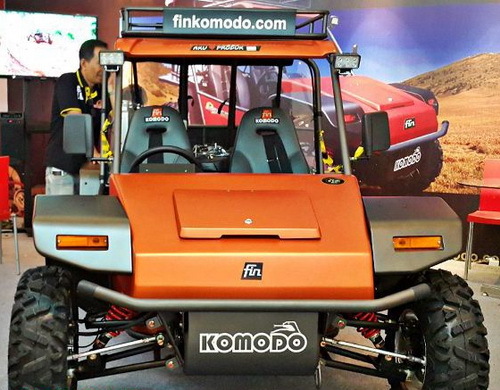 Fin Komodo specialists mini offroad genre car maker launched the latest generation of coastal, plantation, mining and forest vehicles in the most significant change in cabin dimensions to be more spacious and comfortable than the previous generation at Indonesia International Motor Show (IIMS) 2017. "In this event, Fin Komodo is introducing our latest product, this car comes with a refinement of cabin design and some new features," said Fin Komodo CEO Ibnu Susilo, Sunday, April 30, 2017. "The dimensions of width and length remain the same, but we designed the cabin more spacious. Dashboard more forward, frame and roll bar we also raise. Legs no longer stuck to the dashboard," said Susilo. The revolutionary change of interior design is seen from the shape of the seat more comfortable in the sporty character, more centralized cockpit to the rider, and additional power outlets for charging gadget battery. Interior sector in Fin Komodo latest is more spacious and comfortable for riders and passengers. "Drivers do not have to worry about running out of batteries while adventure, we add power outlets, the wheels are not different, the engine is still the same 250 cc and CVT transmission system," said Susilo. Fin Komodo KD 250 X using a capacity of 250 cc engine capable of producing power up to 14 dk. The car is designed as a vehicle is used for various extreme areas. Strong skeletons and tough chassis as vehicles in plantations, mining and coastal areas. Dimensions of length 1,650 mm, width 1750 mm and height 1750 mm to accommodate two people, while the baggage can carry up to 200 kg. The KD 250 X variant is a civil version where Fin Komodo also designs vehicles for the military version.